Thank you for coming in for Student Led Conferences today . I’m so proud of all 13 of our little teachers and I’m sure you are, too. Thank you for being great students! 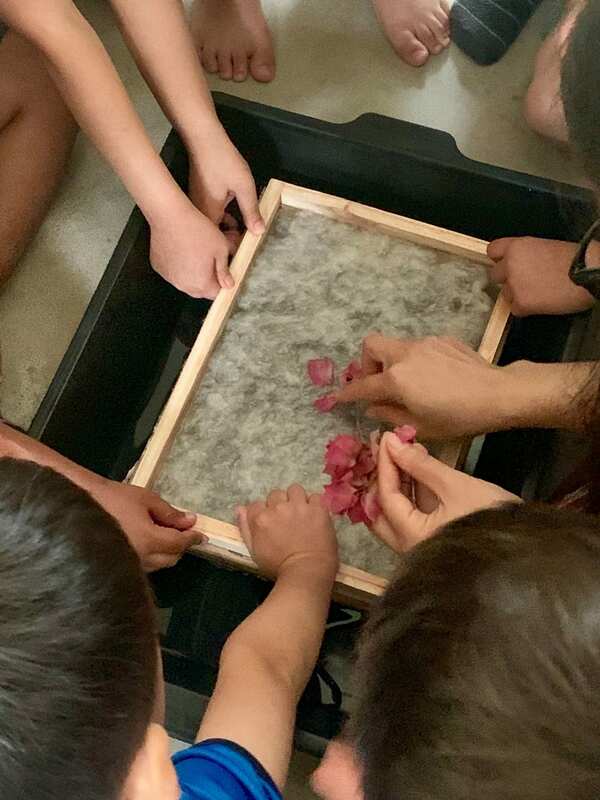 This week we continued to our new inquiry under the transdisciplinary theme Sharing the planet with the central idea: Understanding living things helps us share our environment and resources. The children have been caring for our garden and fish. We started to read a story called Butterfly Park and became very interested in butterflies. What do butterflies need? The children drew and explained their ideas about butterflies and what they need. We will continue to inquire into the characteristics, life cycle and needs of butterflies over the next few weeks. If you see any caterpillars or caterpillar eggs please send them to school! In math we continued to explore patterns. What patterns do you notice at home and in the world around you? Monday is Mother Earth Day and May 2 & 3 we will celebrate Book Week. Please see details about special events below. Please consider donating books to the UNIS Used Book Sale. You can send in any books, in any languages. Please check the Tin Tuc for more information. Thank you for your support! Show and Tell next week. Please help your child bring in something related to animals, insects, or gardening. It may be a book, a tool, a toy, a photo…. Please send in a favourite book to read and a stuffed toy that you like to snuggle up with. The books and toys will be sent home on Friday. 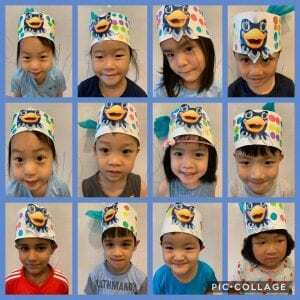 Tuesday May 7th: K1B swimming day switches to Tuesdays. No PE on Mondays. This week we began to explore our new inquiry under the transdisciplinary theme Sharing the planet with the central idea: Understanding living things helps us share our environment and resources. The children showed a lot of interest in gardening over the past few months and we decided to grow our own gardens. We planted flowers and started an upcycling project – taking old milk cartons and turning them into individual garden boxes. The children are learning to safely use tools such as rulers, saws, hammers, screw drivers, clamps, glue guns and pliers in 1:1 sessions with the teacher as they create their planters. Stay tuned to watch our garden grow! 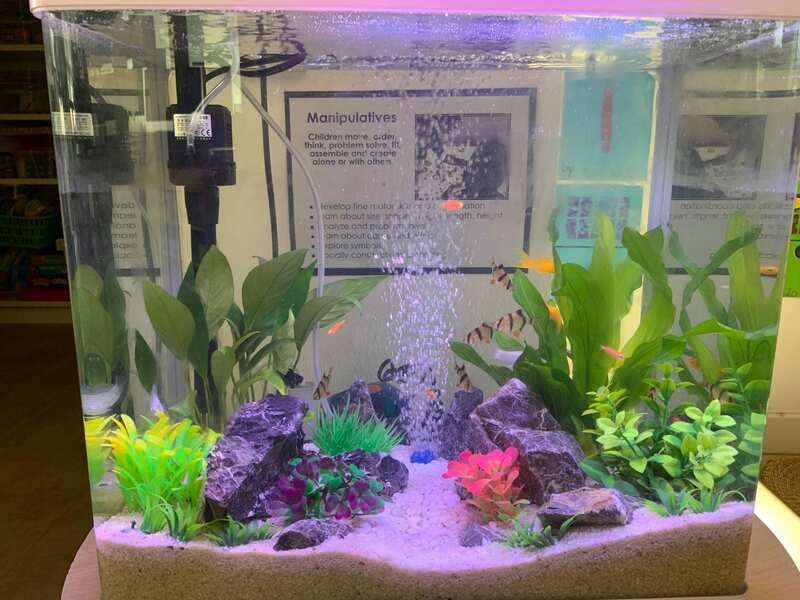 We also have some new class members in our room – fish! Check out our K1B fish tank! In math we are exploring patterns. What patterns do you notice at home and in the world around you? This week we helped cheer on the UNIS high school boys as they played in a soccer/football tournament. We cheered for them at the tournament’s opening ceremony and then again at their first game on Friday. We saw them score two goals! Show and Tell is cancelled next week due to the short week. However, if you didn’t send in a photo from the holidays for show and tell this week, please do so as we will use them for a writing activity. The children enjoyed Sports Day today! We had a lot of fun together. 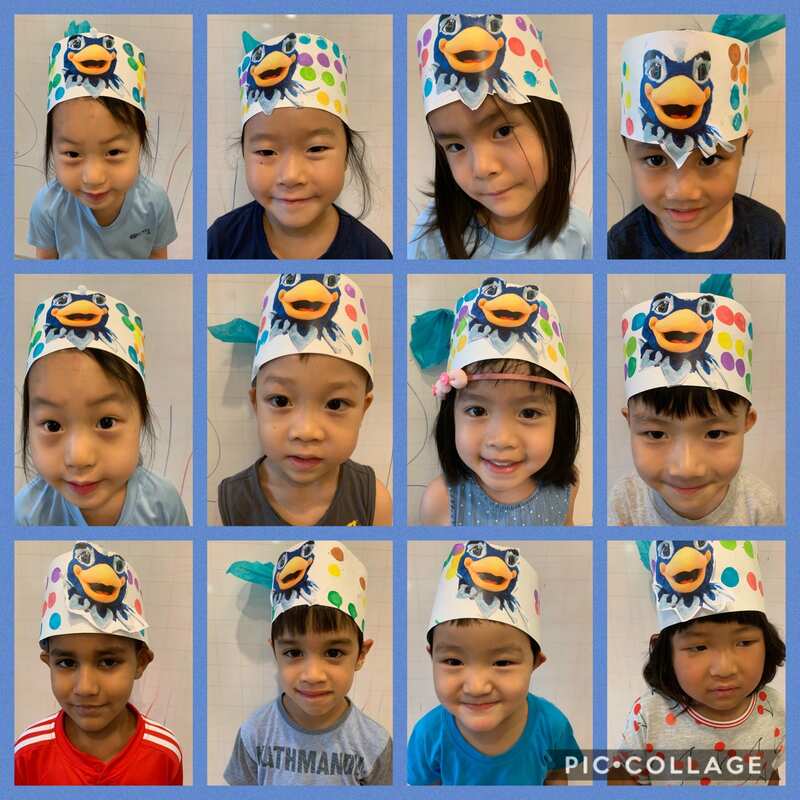 Thank you to the parents who could join in today – we hope you had fun, too! 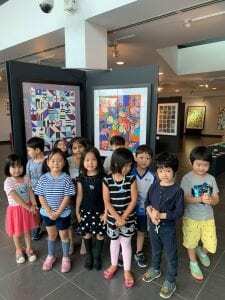 I hope that the children have a wonderful holiday. School resumes on Monday April 8th. Don’t forget swimming on Monday. K1B has swimming on Mondays until May 6th, then we switch to Tuesdays. This week we continued our inquiry under the transdisciplinary theme How we express ourselves with the central idea: Storytelling allows us to share ideas, feelings and experiences. The children shared the stories of how they got their names and what their names mean. They continue to enjoy exploring their own names and the names of their friends. In math we are continuing to review regular dot patterns (the patterns on dice) and numeral recognition. We are also introducing irregular (random) dot patterns. 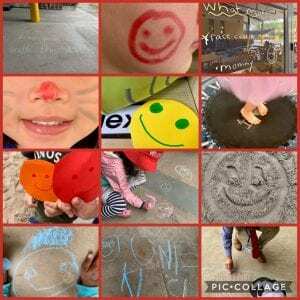 On Wednesday we celebrated International Day of Happiness! 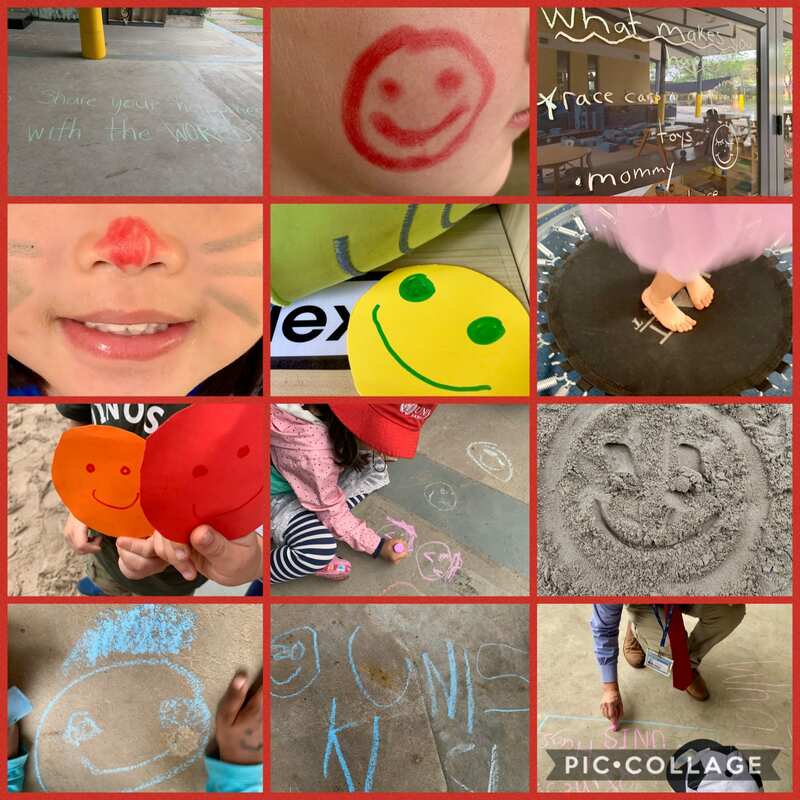 We had music, bubbles, face paint, sidewalk chalk, trampolines, special stories and even special guests. Ms. McGee, our Head of School, came and read a funny story called Mabel Murple to all of K1 and we loved it! What makes you happy? What makes your family happy? ***There are many special events next week – please carefully read the details below. We will have Show & Tell next week: please help your child choose something that can be used to tell a story. For example, a puppet, or anything else that you can think of together. Swimming starts next week. K1B has swimming on Mondays until May 6th, then we switch to Tuesdays. 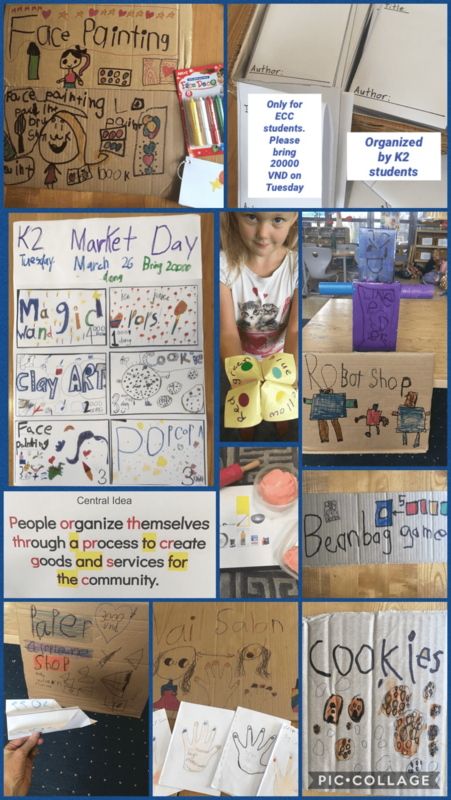 K2 invite you to their Market Day. Its on next Tuesday morning, 26th March. 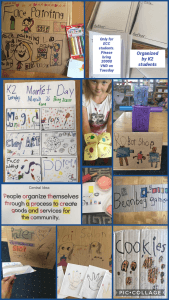 Please help K2 celebrate their learning about goods and services by bringing 20,000 VND to spend. Everything on sale has been made for children by children. This week we continued our inquiry under the transdisciplinary theme How we express ourselves with the central idea: Storytelling allows us to share ideas, feelings and experiences. We read some new kinds of stories to further explore story structure and the roles of authors and illustrators – We Are In a Book, Do Not Open This Book, The Book With No Pictures, and Help! We Need at Title! We are also continuing our inquiry into our names. What information and stories are contained in our names? What do our names tell us about our communities? In math we are reviewing regular dot patterns (like the patterns on dice) and numeral recognition. Thank you to all of the parents and nannies who came in for Open Classrooms this week. The children and I love having you join the learning in our classroom. 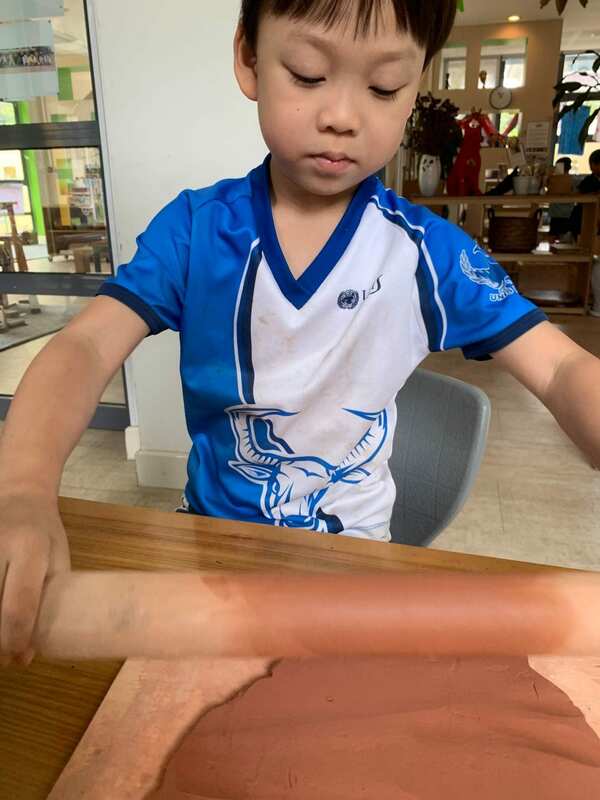 We know that it is important for the children to feel like their home life is included in their school setting and that their class community is part of their wider world, inclusive of their families, languages and cultures. Similarly, we hope that your as parents feel a sense of belonging. Next Wednesday is International Day of Happiness. We have some special things planned for the children, and show and tell will connect with this day (see below). We will have Show & Tell next week: please help your child choose something that makes him/her happy. This could be a photo, a book, a special toy, a special food, a game, or anything else that you can think of together. This week we continued our inquiry under the transdisciplinary theme How we express ourselves with the central idea: Storytelling allows us to share ideas, feelings and experiences. We have been exploring shadow puppetry and shadow performances, and thinking of all of the different ways we can share stories. Mio suggested that we could make a movie to tell a story. Some of Ms. Charla’s K1B students from last year came to show the students a movie they made. The children are enjoying sharing their Show & Tell items and describing them to their friends. Ms. Beth, our ES Math Coach, joined K1 on Friday to teach the children some new math games. We have been inquiring into our names. 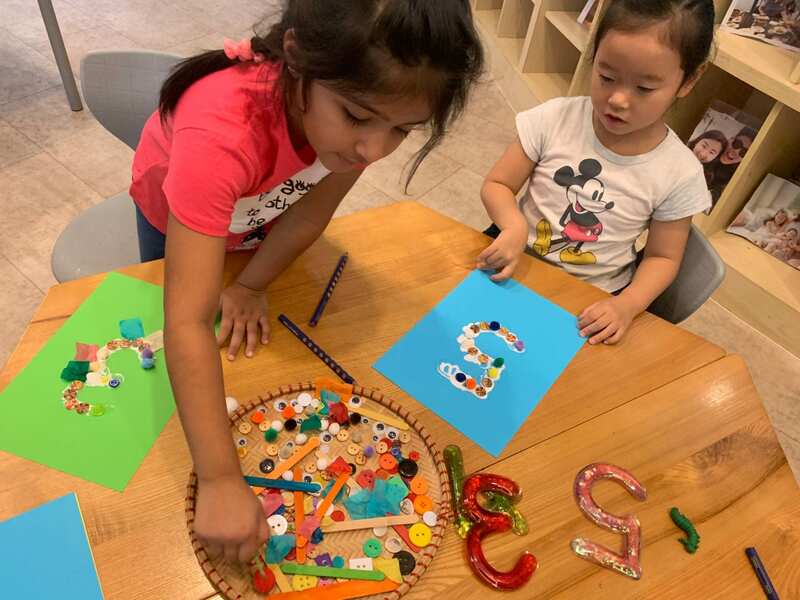 The children noticed many things about the names in our class – length, uppercase and lowercase letters, letters that are at the beginning middle and end of names, how many children in the class have the same letters, as well as what the names can represent. We also read several stories about names. Please talk to your children about their names. How did you choose his/her name? Does the name have a meaning? What is the difference between given names and family names? How long are the names in your family? Today was international Women’s Day. Teddy brought in flowers for each girl in K1B. 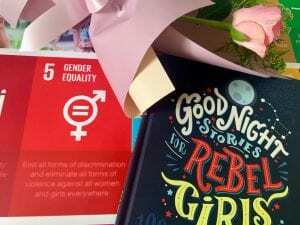 This prompted many questions: “Where are the flowers for the boys?” “Do girls like flowers and boys don’t?” We talked about the UN’s Sustainable Development Goal of “Gender Equality” and learned about some women who have changed the world. The children offered that women can help to change the world in many ways: “Be astronauts and build rocket ships,” “Do science,” “Mommies,” “Write books,” and that men have equal opportunities as well, “Boys are ballerinas.” Thank you to Teddy and his family for the lovely gesture and the thinking that it inspired in K1B. Please join us at Open Classrooms next week – the schedule is below. During Open Classrooms you are invited to join in your child’s learning. We will have Show & Tell next week: please help your child bring in a favourite stuffed toy again. Please note there is no lunch available for parents in the canteen. Coffee and snacks are available for purchase. 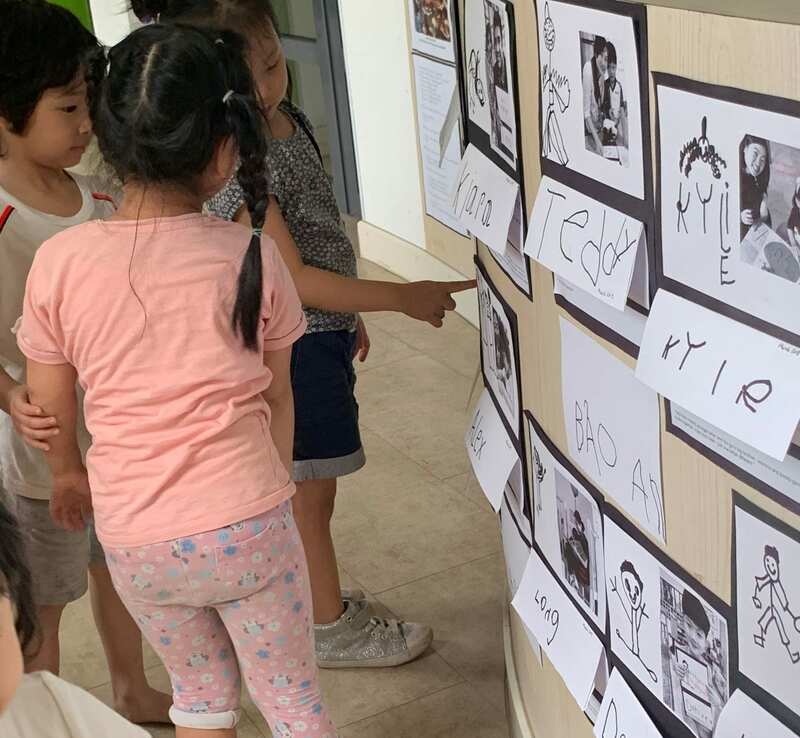 This week we continued our inquiry under the transdisciplinary theme How we express ourselves with the central idea: Storytelling allows us to share ideas, feelings and experiences. We wrote and drew about our favourite Robert Munsch stories. We set up a shadow puppet theatre under our loft. This week we began Show & Tell. The children were confident communicators. They described their favourite books/characters to the whole class and then shared their stories in small groups. We have been counting to 10 and back from different starting points, and using our fingers to show amounts. Ask your child to teach you how to play “Beep” at home. School begins at 8:10am. Please drop off your children before 8:10. School ends at 3:20, and at 2:20 on Wednesdays. Please pick up your children at 3:20/2:20. Home snacks. At UNIS we ask parents to please send in healthy snacks for your children. Fruit, cut vegetables, cheese, nuts, small sandwiches, yogurt, hummus and other natural, low sugar foods are best. While the occasional treat is nice, please do not send in candy for snack. Cake, cookies, candy, and sugar cereals do not provide the kind of nutrients to help the children get through the school day. Thank you for your support! 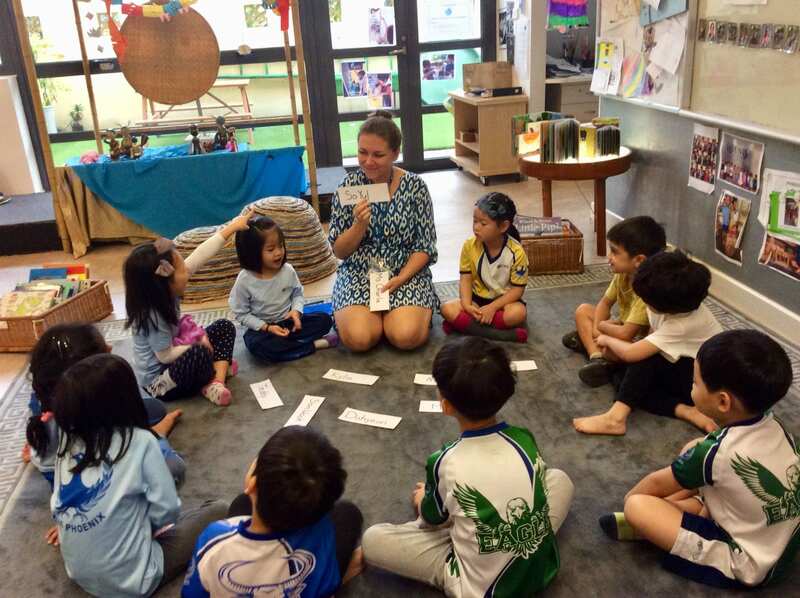 This week we continued our inquiry under the transdisciplinary theme How we express ourselves with the central idea: Storytelling allows us to share ideas, feelings and experiences. 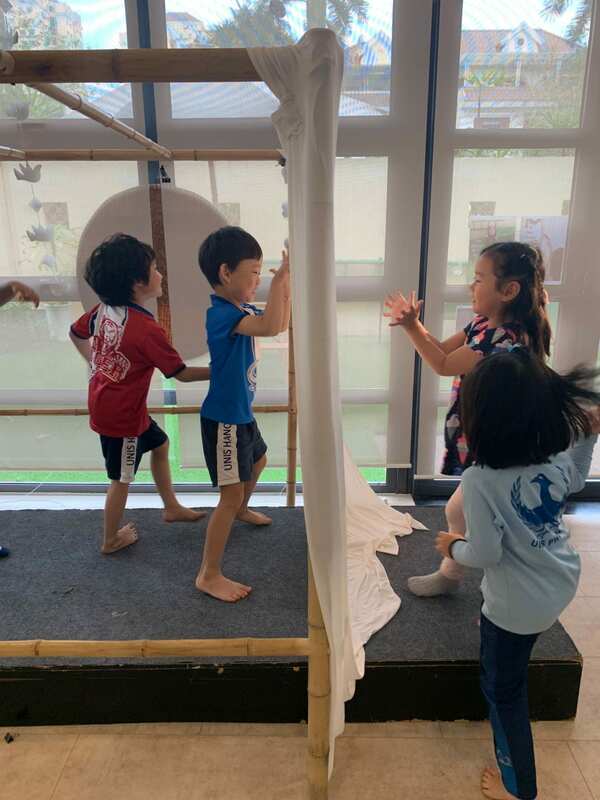 The teachers noticed that the children are creating imaginative stories in their play in the classrooms and during outdoor play. We continued reading Robert Munsch and other stories. When you read stories at home, please ask your children “what do you think ABOUT the story?” Next week we will begin Show & Tell. Please see details below. Thursday was International Mother Language Day. Mio and Kiara were risk-takers and said “konichiwa” and “namaste” on stage during the Lower Elementary School Assembly. Don’t forget to take a look at the Art Auction in the foyer of the Centre for the Arts. You should have received an email with a photo of K1B’s beautiful art piece and bidding instructions. All proceeds go towards a charity started by a UNIS student – Operation Healthy Heart. Ms. Kris introduced “safe” and “unsafe” on Tuesday as part of the Being Body Smart lesson series. In the weeks following the Tet break our D-2 School Counselor, Kris Bezzerides, will begin a series of lessons about Being Body Smart. One of the main goals for these lessons is to provide our children with knowledge and teach protective behaviors in regards to their bodies and their right to be safe. 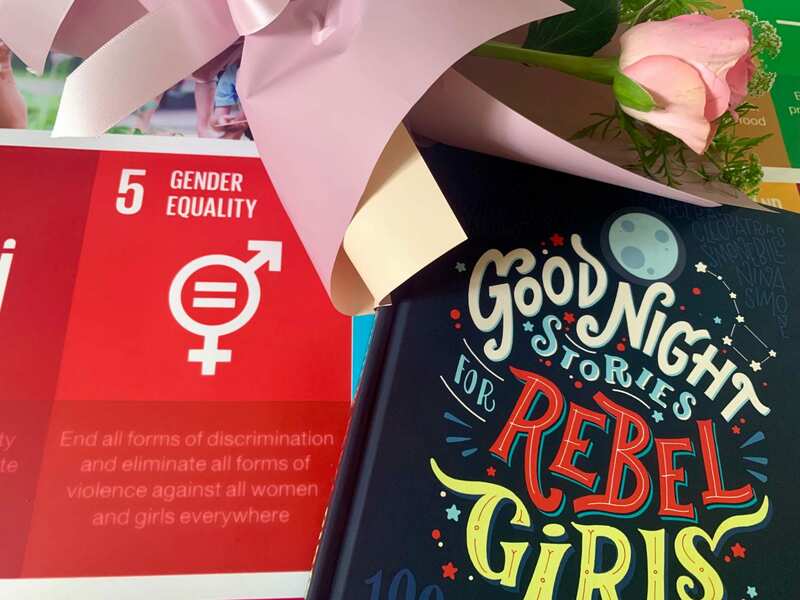 These lessons are age – appropriate and designed to empower students.